One of things that has mystified us in March of last year when we got the 1991 Pioneer, 5-speed manual, inline 6, 4x4 is that the horn wasn't working. The assembly appears to be all there. Also, the Jeep cap on the steering wheel is loose and when I put it back on, it doesn't flex inwards for the horn to function. I'm sure I sound like a damn fool, but how the heck do I troubleshoot this? Get a new steering wheel? If so, from where? Replace horn flux capacitor/fluid? Haha. Also reason I mentioned the exact spec of the Comanche is because ours has a 3 spoke sports wheel w/o an airbag. I've seen other Comanches with airbags, and different design wheels. So I'm not sure if it's trim specific, or just model year. I'm still trying to figure out how to edit my. signature on this Tapatalk Android app. have you applied power to the horn to confirm that it works? I had the same issue on my 88 way back when, and it turned out the issue was due to the horn being... missing. 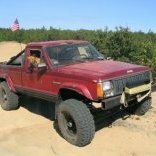 You have not seen any Comanches with airbags, because the last Comanche was 1992 and Chrysler didn't start using a driver's side airbag in the Cherokee until 1995. The horn button doesn't flex inward. The entire steering post cover moves inward to activate the horn, and pops back out when released. It sounds from your description that you are missing at least a spring, and probably a couple of other parts. He's referring to 97+ conversions. 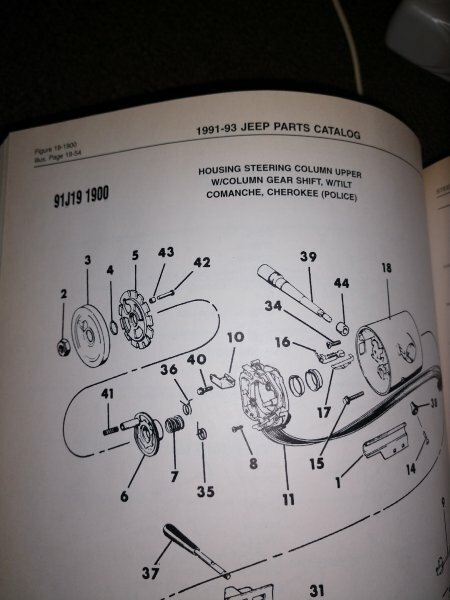 This thread has some good photos and descriptions of the horn button components in the steering column. The centre cap is loose because it is the button. Some fit less snugly than others, especially if some of the tabs on the back of it have been broken. Have you confirmed the electrical portions of the horn circuit are functioning? This is what should all be in the column.